Summary: Most people focus on the month-to-month changes in the jobs report, which consists mostly of noise (recently unpleasant noise). The year-to-date and 12-month changes are more revealing. We remain in a slow recovery, somewhat faster than in 2010. The results of the past two months (not shown here) suggest severe slowing! Enjoy this progress, as it was bought at great cost. A cost we cannot long continue to pay. 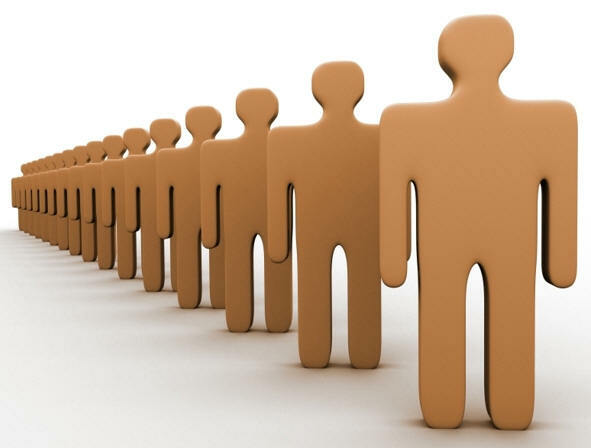 Here we examine the May employment report from the Bureau of Labor Statistics. They conduct two surveys: one of households, one of businesses. They are not directly comparable, each giving different perspectives on the US economy. Today we look at the changes year-to-date and especially year-over-year changes (the latter avoids seasonal adjustments and distortions from the warm winter). The picture painted is consistent with the many other streams of information about the economy — effective rebuttal to both those seeing a good recovery as well as the cultists insisting all the government data is faked to re-elect Obama or benefit the Trilateral Commission. The important detail to know about the recovery: during this period the government’s public debt increased aproximately $1.3 trillion — aprox 8.5% of GDP (see debt here and GDP here), one of the higher fiscal deficits in the world. Our shiny recovery results from massive borrowing and spending, without which we’d be in a deep recession, like Italy or even Spain. In other words, organic growth has not yet resumed. The US economy has stabilized and slowly improves due to the massive “drugs” of monetary and fiscal stimulus. Both have severe side-effects, which at some unknown point in the future will become problematic or untenable. But the worst side effect was unexpected: the stimulus eliminated the pressure for reform. We have had the New Deal stimulus without the New Deal reforms (some of which failed, but some set-up the great post-war boom). The Current Population survey is a simple survey of households, with large error bars but no revisions. It’s worth watching because it’s the basis for the headline unemployment rate, it gives some useful data not in the more-accurate business (establishment) survey, and because some research suggests that the household report shows inflection points before the establishment survey. During the past year, the number employed growing at the roughly same rate as the civilian non-institutionalized population. But the number not in the labor force grew even faster. The seasonally-adjusted results year to date show 300 thousand new jobs per month. But the past two months have seen only 127 thousand new jobs per month. The second survey asks employers to report jobs. It shows a similar pattern of growth as the household survey, giving us confidence in the results. Slow improvement. These are non-seasonally adjusted numbers. Any way you count it, unemployment has decreased during the past year. Slowly. These are non-seasonally adjusted. Previous Post The global economy is sitting on a volcano. What happens next? I started looking at the CES report this morning and noted that the Labor Force has fluctuated by several hundred thousand since January. I decided instead to look at the entire Obama administration’s term — the result is a bit surprising. Only 100,000 jobs added in Obama’s entire term. That analysis is misleading in several ways. (1) The disparity between the change in population and jobs results largely from demographics, so the implied blame of Obama is incorrect. BLS reports non-seasonally adjusted age-cohort changes. Labor force participation drops rapidly after age 59. 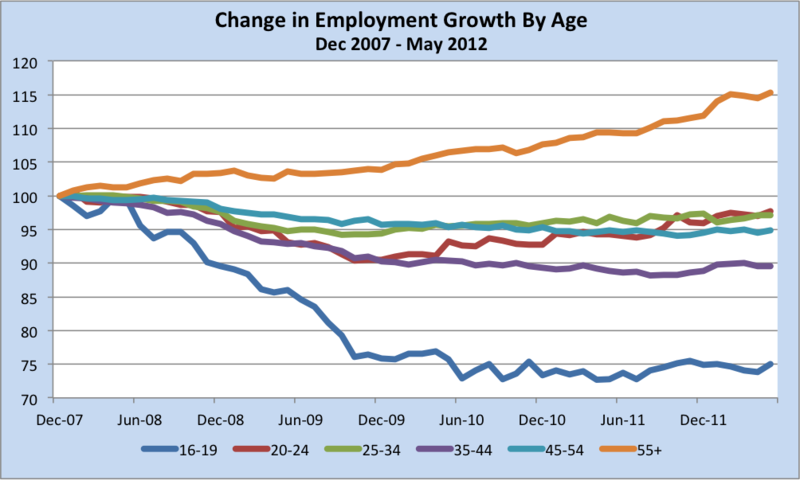 Looking at the period you use, Jan 2009 – May 2012: change in population, labor force, and employment. The adult civilian non-inst population increased 8.2 million, but 6.1 million of that was people of 60+. (2) Using the month of the inauguration as the starting point is not meaningful. The 2009 budget was passed before the election. It takes months for a new President to have substantial effect on policy, and 3 – 9 months after that for even fast-acting new policies to affect the economy. Inspired guess in pursuit of conspiracy theories! I’d ask for evidence, but it’s a waste of time. Fie on this pessimism! Drug gangs are doing quite well. See eg: “Drug gangs make huge profits from cannabis factories“, Irish Examiner, 21 May 2012. By continuing the War on Drugs, Obama is doing his bit to boost these profits. And the United States provides more free food and housing through its prison system than does any other country in the world. Anyone who fails to appreciate this logic should smoke a few joints. Then it will make perfect sense. The unadj. group 65 yrs. and older population increased by 3.9 million and employment in that group increased by 1.17 million. 29.8% is well above 16.3% employment to population ratio of Jan 09. So, a generalization about workers over 59 having a lower participation rate is dubious. I could rework the report by working age and over 65 years, but I believe the working age level will go negative by some portion of a million jobs. This would just confuse the less sophisticated reader without a “certificate” in BLS. Finally, Population controls are expressed across all of the three data-sets I used for the blog post. The only problem I see with the blog is that I’ve stretched the definition of unemployed somewhat. I’ll sleep fine over that one. I have no idea as to what you are attempting to say, but it looks wrong. For 65+: 18% and 17%. The numbers you post are from the BLS website. They are aggregates of the designated age groups — not with “population controls”, whatever that means. I thought you had referenced the annual “Population Controls” in the raw data. Someone elsewhere objected to that comparison. What I’m saying is that for the 100,000 employment level increase for all ages in the period, 1.17 million jobs went to persons age 65 and older. This is a 29.8% Employment to Population Ratio, for the 3.9 million population growth in the sample period. A cohort involving the Participation Rate is as useless as following the U-3. The Labor Force Participation Rate tells us nothing about the Population and the NILF. Again, I could separate the two age-groups, to find how many jobs were lost in the working age population, but in the face of these numbers, why bother? I’m sure you are attempting to say something, but I have no idea what it is. In your original response, you’ve argued that my article is “misleading.” You wrote: “Labor force participation drops rapidly after age 59.” And then you’ve displayed data that apparently doesn’t support your statement. If this is what you meant to convey, I see the change in employment levels and Labor force levels exceeding change in population levels. How is this a drop in participation? How are these aging statistics different from any other recent 41 month period? How does a sample of a single time period make my analysis misleading? As an aside, I find it extremely difficult to believe that 75% of the addition to the CNIP is 60 years and older. We take in 1.2 million supposedly young(er) immigrants per year and US births (4 million) over deaths (2.4 million) adds an additional 1.6 million per year. US born children should be roughly 5.2 million of the 8.2 million CNIP increase, or 63%. As for your second point of contention for my article being misleading. It’s quite customary to measure a presidential administration by employment level growth, measuring any other time period would be misleading. We would have to make a subjective assumption that this administration’s policies did not deepen the recession to make an exception on the traditional start date. If it is the policy to bring in over one million immigrants per year, it is more than fair to measure the effected population. At this point we are importing poverty and practicing the economic-expulsion of citizens. You don’t appear to understand what you are discussing. You confused two separate issues. (a) The relationship between participation and age. Participation varies between age cohorts at each point in time. It’s a snapshot. (b) Trends in participation of each age cohorts over time. It’s a dynamic factor, aka a trend. Everything changes. There is a large literature by experts discussing these issues. I recommend using google (or if you would like high-level material, google scholar). Yes, but not by serious analysts. For example see the recent discussion of government spending increases by each President (I don’t have time to post links). Analysts carefully assign spending to the responsible President, not using inaugeration as the starting point. *** I’ve been a good sport about this discussion, but it’s grossly off-topic. Per the FM website’s comment police, comments should discuss the post (or at least reply to someone else’s post). You have a website, to which your comments post. Please continue your discussion of other issues there. And some people actually think there were really 69,000 new jobs created. Some would ask for evidence, like maybe photos of (the recently unemployed) guys with clickers running all around the Country “tabulating” the new jobs or little Phone Rooms staffed by the “no longer looking” folks calling employers to see who hired this Period. But that would just be begging the question, so to speak wouldn’t it? Life is somewhat about inspired guesses. The various strands of the tapestry have to match, both in real time and (more importantly) two years later when the final data is in. Anomalies in the real-time data receive considerable attention, but are almost always resolved in the next year or so. Any substantial manipulation would be easily seen. That’s the reason to trust the data, within its known limits of accuracy and precision (ie, the known large error bars of the real-time data). The states, at least, should have an accurate count of who is employed. Whenever you employ someone legally, here in California at least, you notify something called the ‘EDD.’ You have to pay these guys a pile of taxes for every employee to cover unemployment insurance and other things. Also for legal employees you need buy workman’s compensation insurance in case someone is injured on the job. Obviously there are going to be some employees that are not measured this way. There are quite a few people employed in the illegal narcotics, also a lot of construction and day labor is paid with cash. I did have one experiences with this office. My business is very unstable, and I’m always hiring and laying off people based on the current available work. The odd thing, though, is that the EDD office has this weird tendency to try to get money out of you even after you tell them you fire people. We had a handful of people working here, then I got rid of them all due to losing a contract. We filed all the forms and told them that these guys were gone. But what happened was that EDD kept pestering us for continued payments, over and over and we had to keep telling them that all these employees were no longer working here. We settled it, but it was one of those big fat letters saying we owe vast amounts of money followed by long and miserable phone calls and letters to settle the matter. I don’t know if this is a systemic issue of if it affects the statistics or not. Employees are a pain if you are a small business. It’s better to avoid them, if you can — though this is not always possible. If you need for someone for more than about a 3 months or so, then it makes sense to just hire them. Tax computors , not employees . 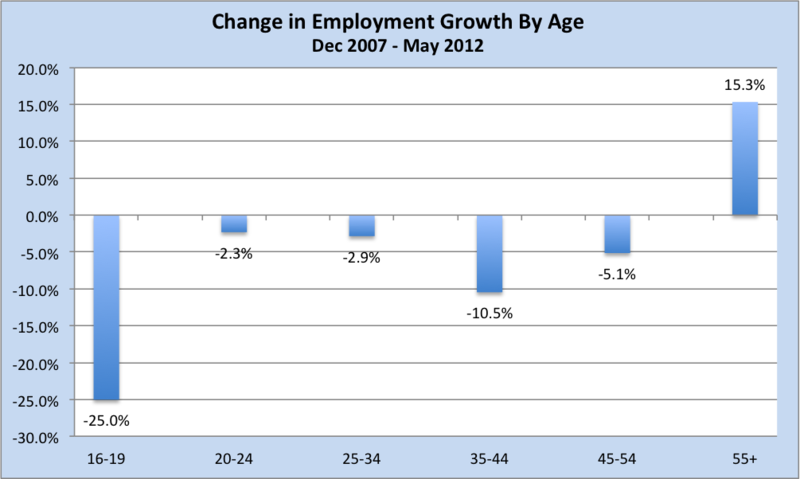 Here is a look at trends in US employment by age. Older workers are staying employed, leaving no room for young to get on the ladder. “The Not So Golden Years, Revisited“, The Big Pcture, 3 June 2012.